Our attorney-crafted Release of Liability (Waiver Form) is a legal document between two parties that want to address the possibility of an accident occurring. Create a set of rules and regulations that users must agree to follow. The Definition: What is a Release of Liability or Waiver Form? 1. The Basics: What is a Release of Liability or Waiver Form? A Release of Liability Form or Waiver of Liability Agreement is a legal document between two parties — the Releasor or person promising not to sue — and the Releasee or person or company who is potentially liable. 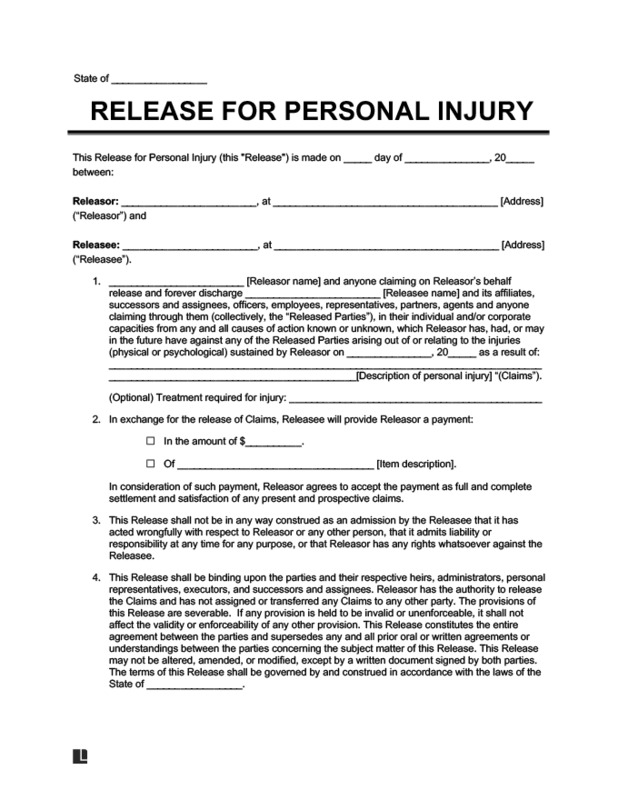 By signing this form, the Releasor acknowledges that he or she understands the risks and claims involved and agrees to not sue the Releasee for past or future injuries or damages. This form is alternatively used when an accident like a car wreck or property damage has already occurred. Instead of going through an expensive lawsuit, both parties agree to settle the dispute out of court. A Liability Waiver can be a much cheaper option by settling out of court for things like car accidents. This form can be used to document a person’s consent to be photographed, filmed, or recorded in a public event or activity. A separate Photo Release Form can also be used. 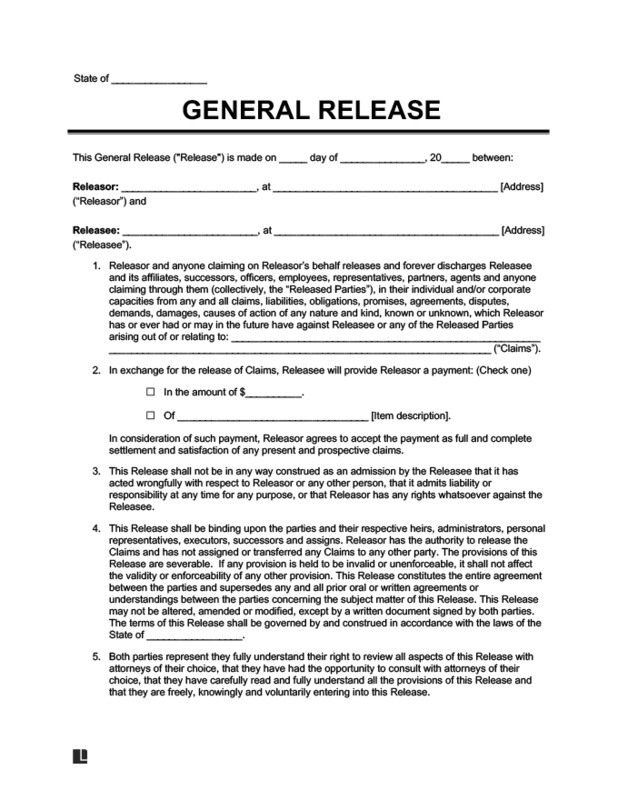 The sample release of liability form below details an agreement between the releasor, ‘Josh J Tarvar’, and the releasee, ‘Cynthia S Townsend.’ Josh J Tarvar agrees to release Cynthia S Townsend from any claims arising from the termination of a contractual relationship between the two. A Release or Waiver is often needed either before or after an incident occurs. Organizations or people may be concerned about being taken to court by someone who accidentally gets injured while attending an event or activity they will be sponsoring. Alternatively, this form is used when an accident like a car wreck or property damage has already occurred. Instead of going through an expensive lawsuit, both parties agree to settle the dispute out of court. Check out the 6 different types of Liability Waiver Templates below and download the one that applies to your situation. A General Release is often used when one person is broadly giving up all known and unknown claims against another party. This document can cover broad claims that are filed in the most common dispute cases. While this version is the most basic of the six, it flexible and comprehensive enough to handle most situations. If you need a waiver for a specific situation, then you should consider taking a look at our other templates below. Unlike the general form above, a Mutual Release is used when both parties give up all past and future claims against one another. In most cases the dispute is over a broken contract in which the two parties believe the other is at fault. 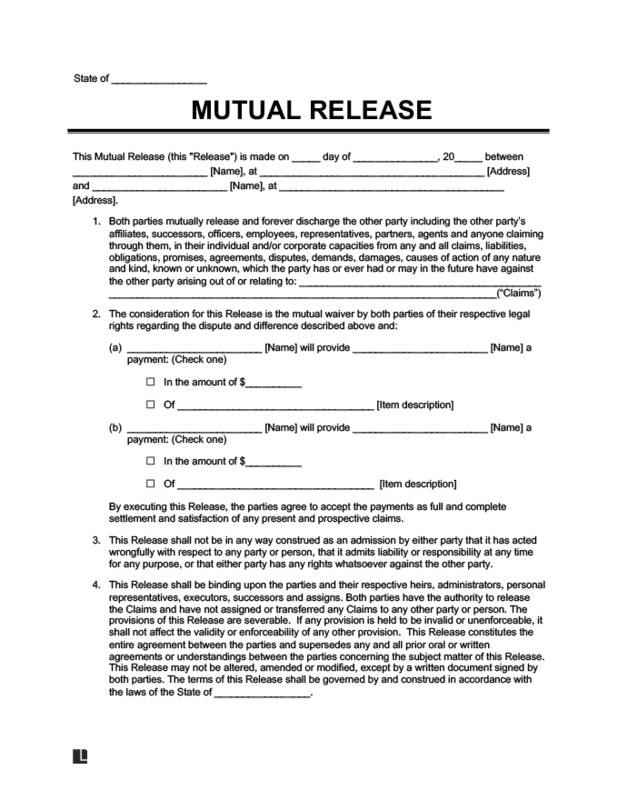 Instead of getting involved in a long and pricey legal process, the two parties can use this form to agree to walk away from the contract on their own terms. In the case of a car accidents, the parties involved in a traffic collision can decide to use this form to agree not sue one another. The party that was injured or received damage to their vehicle can decide to waive liability from future compensation for the accident in return for an agreed upon payment from the party that caused the accident. Again, both parties are able to avoid the hassle of going to court. The document on the left is used when real property (i.e. land or building) or personal property (i.e. jewelry or movable possession) is harmed and the parties settle the dispute out of court. Before you compensate someone for property damages that you caused, make sure that you use this document so that the property owner cannot ask you for more money down the road. This waiver of liability can be used for cases of personal injury in which a person is injured or harmed and agrees not to sue in exchange for a certain amount of money or value. Personal injury can be considered both physical or psychological. One example of when this document could be used is if the releasee’s dog rans into the releasor’s yard and bit them in the arm. This last document is frequently used by event and entertainment companies that require their customers to give up all future claims against the organizer or owner for personal injuries that may occur. 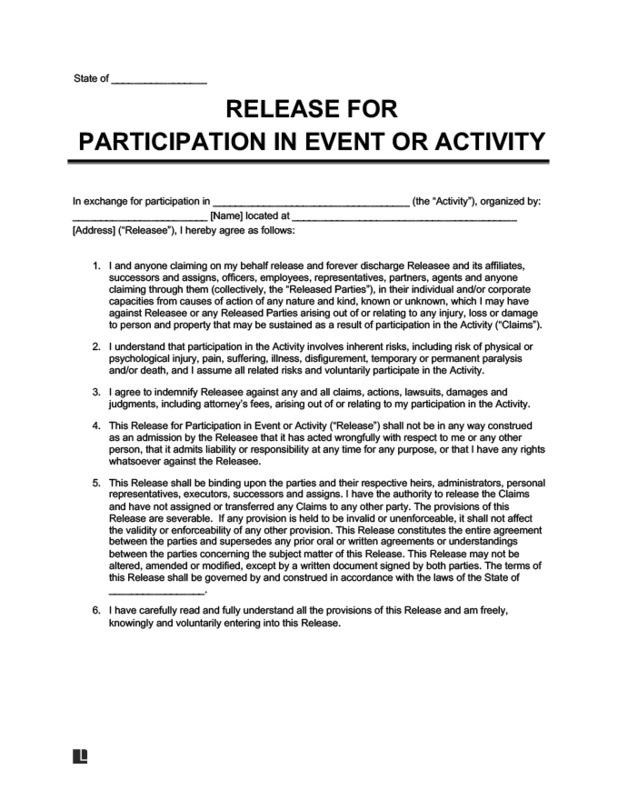 It is common to sign these forms when participating in activities such as paintball, sports leagues, and other athletic events. However, keep in mind that a liability form usually does not cover accidents or injuries caused by negligence or the failure to exercise reasonable care over a situation. Depending on the state you live in, you may need a waiver of liability when selling your car. When you sell your car, until the title and registration is transferred you are liable for any accidents or injuries caused by the buyer. Therefore, most states require you to notify them within a certain amount of days after selling your car. To ensure their liability is waived, residents of California who sell their car are required to fill out a Notice of Transfer and Release of Liability Form. The Department of Transportation in Idaho requires its residents to fill out a Notice of Release of Liability. Find out if your state requires a waiver form to sell your car, here. Court fees can be high and also avoided by using a Liability Form. What happens if you don’t use this form? Without a written Waiver, everyone faces the possibility of being summoned to court or dragging out a disagreement over who owes what. Why put yourself at risk when you can utilize a Liability Form instead? A Liability Form is an easy form to complete that can save you from expensive court fees. A Waiver Form can address incidents that have already occurred in the past or may happen in the future given the inherent riskiness of the activity.